Why does 1,2-dimethylcyclohexane in chair form have only three stereoisomers? I understand that the trans isomer doesn't possess plane of symmetry and thus it has two stereoisomers. But my book says that the cis isomer has does not have two stereoisomers. Why is this so? 1,2-dimethylcyclohexane has two chirality centers. The cis-diastereomer has a plane of symmetry bisecting the ring bond between the two methyl groups and therefore a meso compound.It is not chiral and does not rotate plane-polarized light.The trans-diastereomer exists as a pair of enantiomers. The chair conformation of cis-1,2-dimethylcyclohexane shows that it is chiral. 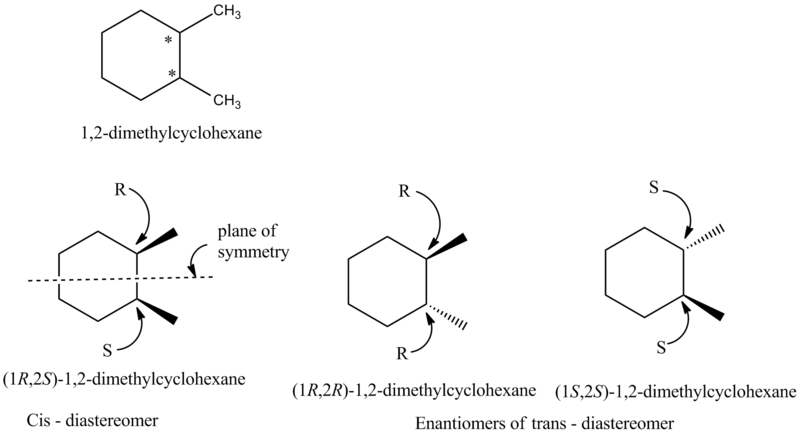 But due to ring-flip , another conformation ,its enantiomer of the original conformation is also formed.These conformers interconvert rapidly at room temperature, therefore cis-1,2-dimethylcyclohexane is not chiral. "stereochemical analyses such as the preceding one can be done with drawings using planar rings" pg.235. Not the answer you're looking for? Browse other questions tagged organic-chemistry stereochemistry cyclohexane or ask your own question. Is cis-1,2-dimethylcyclohexane a meso compound? Why is trans-1,2-dimethylcyclohexane an enantiomer? Is rotation of a mirror image allowed in order to determine chirality? Doesn't rotation alter the mirror image of the molecule? Does an axis of symmetry determine chiralty? Can the following compound having a centre of symmetry be called both optically inactive and meso? How many stereoisomers are possible for 1,2-dimethyl-4-(propan-2-ylidene)cyclopentane?